If you find that you love sharing your sweets with your dog, you may be in for a (nasty) treat. Yes, the truth is that chocolate is poisonous to dogs. Why is chocolate poisonous to dogs? Chocolate is made up of cocoa; cocoa contains caffeine and theobromine. While caffeine isn’t harmful to dogs, theobromine is. 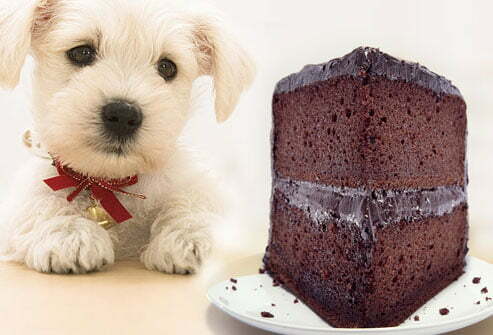 Why is theobromine poisonous to dogs? Theobromine becomes toxic to a dog when it ingests between 100 and 150 milligrams per kilogram of body weight. According to this page, different types of chocolate contain different amounts of theobromine: it would take 20 ounces of milk chocolate to kill a 20-pound dog, but only 2 ounces of baker’s chocolate or 6 ounces of semisweet chocolate. It is not that hard for a dog to get into something like an Easter basket full of chocolate eggs and bunnies and gobble up a pound or two of chocolate. If the dog is small, that could be deadly. Unlike humans, who can metabolise theobromine within ten to twenty minutes, dogs may take up to twenty hours. What treatment can be sought? According to this page, there is no specific antidote for this poisoning. Because the half life of the toxin is 17.5 hours in dogs, veterinarians would try to induce vomiting in the first 1-2 hours if the quantity is unknown. Administering activated charcoal may inhibit absorption of the toxin. An anticonvulsant might be indicated if neurological signs are present and needs to be controlled. Oxygen therapy, intravenous medications, and fluids might be needed to protect the heart. Milk chocolate will often cause diarrhea 12-24 hours after ingestion. This should be treated symptomatically (ie: given fluids etc.) to prevent dehydration. 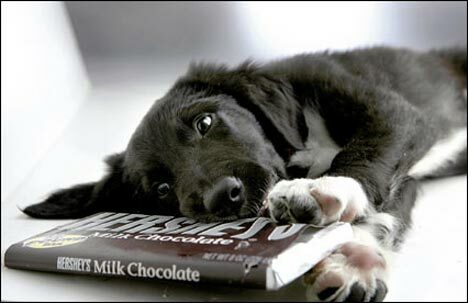 If you suspect your pet has ingested chocolate contact your vet immediately. Your vet can help you determine the the proper treatment for your pet. The next time your dog tries to cajole you into giving him some sweet treats, think harder before giving in.